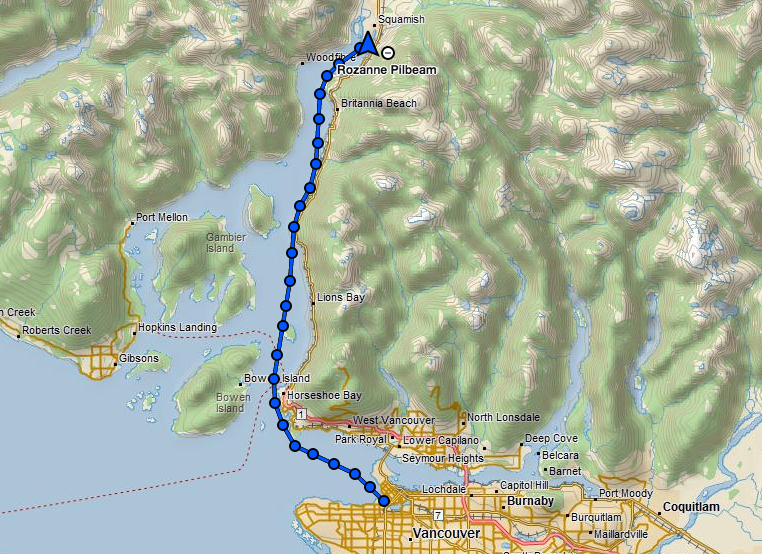 Yesterday I paddled from Vancouver to Squamish, just over 60km in about 9.5 hours. When my friend Morgan drove me back to Vancouver after paddling the last leg with me from Porteau Cove, the distance seemed far greater by road than it had on the water (though it only took a fraction of the time by car). Route tracked on my Delorme inReach. Morgan, (who has volunteered to be my support crew in the Yukon) dropped me at Vanier Park at 6:30am and then headed off to work while I packed my boat with all my gear and set off on the water. Unfortunately I realised the P&H Cetus LV, which I’d opted to paddle after various rental challenges and a week long debate with my friend Dave (who I swear never wants to engage in conversations involving boat choices again), simply was not the right boat to use on a trip of that distance. My mood was a little tarnished from the time and energy lost in the swap (2 hours and 6 additional kilometres), but I was surprised at how quickly I managed to enter the sound for the slow grind up to Porteau Cove to meet Morgan. 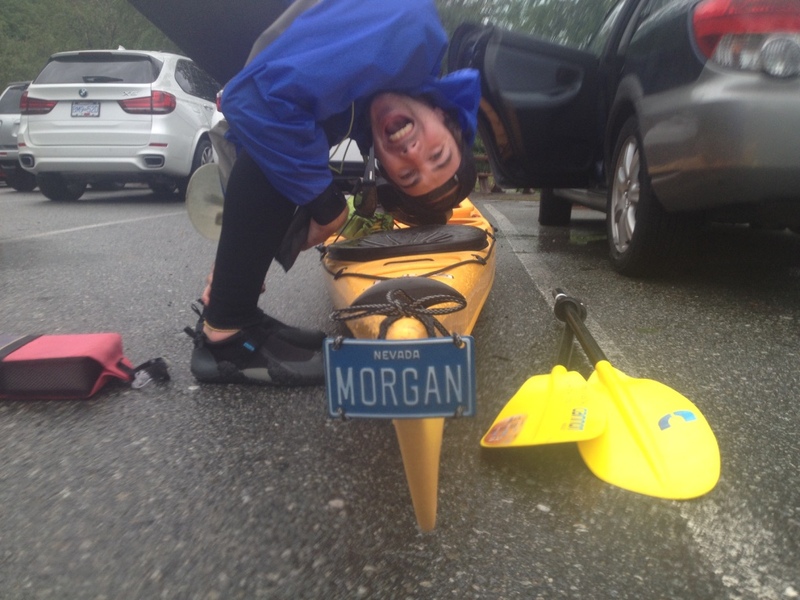 Having company for the final leg was tremendous, especially as Morgan has a delightful sense of humour, which will certainly come in handy when I arrive in Carmacks at the half way point on the Yukon after 25-30 hours of paddling. Morgan and I immediately became friends when he started working at the store after his 2015 PCT hike, and we’ve since come to find our combined sense of adventure has truly cemented our friendship. Morgan adopted my plastic Jura for his leg of the journey. To top off the experience our friend Dave (who also works at the store), paddled out to meet us just prior to entering Squamish. He laughed about the debacle of my boat choice, and brought Hobnob biscuits and Howe Sound beer to celebrate. Dave was the inspiration for the trip, suggesting that if paddled all the way to his hometown he’d buy me beer and drive me back to Vancouver. Challenge accepted Dave! Thanks for the motivation (and for donating or lending me at least half of the gear I own)! 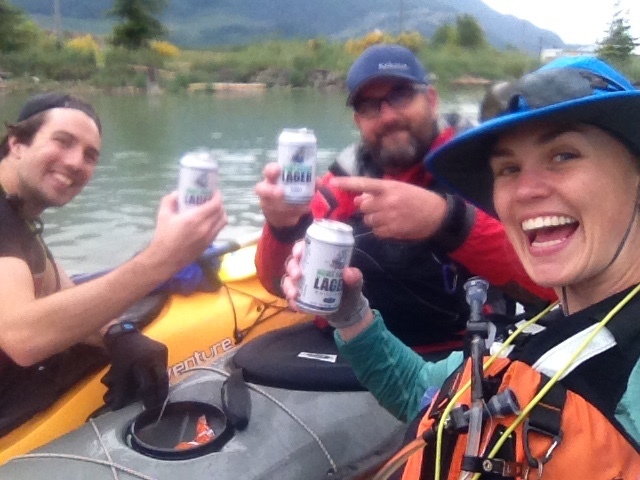 Morgan, Dave and I celebrating with a Howe Sound Lager at the completion of the trip. Previous PostA sad update on The OtterNext PostOne month to go! Great video. It looks beautiful there. Hey well done and the video gives a good sense of all the stuff and prep that’s needed to paddle well and safely. Looks like you are in good shape physically and mentally. Do you plan to do any night paddle? Guess you’ll need that for the Yukon and I’d imagine that would feel so different and create quite different challenges. Thanks Dadda! Too dark to do night paddles here, plus rest is more important than losing a night of sleep at this stage so I’ll be saving it all up for the race! Thanks Graeme this is very useful! Agree with all your points, though I haven’t been able to source the same boat down here to practise in so that’s been a tough reality to swallow. The seat has been my biggest concern and rightly so. Again I’ve tested many options but not in the actual boat. My most recent long paddles I’ve had all my gear in the boat which has been a good rehearsal on many levels, but again, all different boats. If I could do this all again I would have pushed to source a boat in Vancouver to train and race in. But I’ll just have to manage getting comfortable with it a few days before! If you have any other advice please don’t hesitate to share more. Thanks again! You’re welcome. Just points to consider. Sounds like you’ve got lots under control. I reckon a few days before will be OK given your training in a variety of boats. If you can get hold of an Olympic flat water sprint K1 for some training sessions that will do wonders for the balance as they are very tippy. You’ll know your balance is spot on when you can sit in the K1 stationary an twirl the paddle over your head like a helicopter rotor, ha! The training and preparation you are doing for the race is truly amazing and thanks for keeping us up-to-date with what you are doing. Any ideas on what you might do after this? Arghh, that reply re seat padding should have read ‘two bones in the bum’ sorry,the typo makes it sound rude which it certainly was not meant to be!! Haha no worries! I hadn’t read anything into it but thanks for clarifying! Not that there’s anything wrong with what that! Good luck with the Quest! Haha! I had to think for a minute what you meant, then I remembered the whole debacle with the Aarn pack (I think it was called!) Good memory! So, boy, am I glad you are working hard to get ready for the Yukon….Have you ever watched “Yukon Men”?…..there are many shots of the Yukon…..kind of gives me an idea of your challenge….By the way, is the current going to be helpful….or are you going against the current….I guess I would assume that you are going with the current….and does your instrument show which way to go?….lots of off-shoots any river for the most part….just wondering…. I think you said the June is your time to go on this adventure….Let us know when you are going to do an overnight paddle….curious about that…. Thanks Barbie! I spent hours last night marking and colouring in my maps! The river is so long there are so many pages. It’s tiring colouring it let alone paddling it! 🙂 Thankfully we’ll be moving with the current, except for Lake Laberge. I’ll have to look up that movie you mentioned! Unlikely I’ll be doing a night paddle but I’m gearing up for one last long paddle before the race. Details to come! it’s at a television program that not fiction but real life….so you try to locate it pretty easy to find…yesterday i had surgery on my left thumb because the joint where hand bone leads to thumb bone lost it padding and was rubbing bone on bone…. the surgery removed the bone nearest to my hand//no fun … had both knees fixed because of the same thing…..ugh! Two replaced knees and left thumb…and right thumb is also most be fixed, have to wear cast for six weeks. Good job Rozanne! Sounds like you had a good paddle. The Squamish/Vancouver route is great training for YRQ. Looks like you might have had slightly more favourable wind and water conditions than we did going the other way! Thanks team! I believe I got very lucky with weather and tides on Sunday! Hey Barbie I hope you’re recovering well after your surgery and that you’re not out of action for too long! !